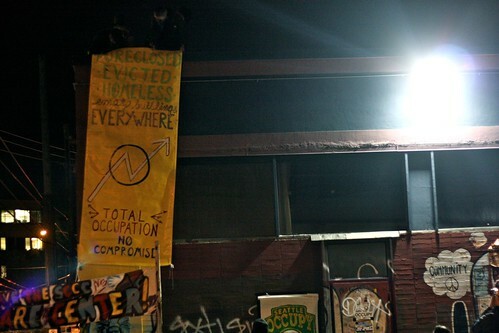 Last night, undeterred by the city’s destruction of their original encampment, hundreds of Occupy Seattle supporters occupied a vacant warehouse slated for demolition and condo development. 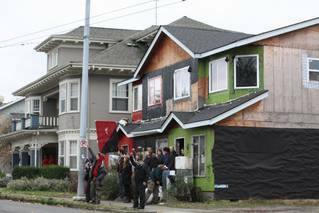 After entering, Occupiers erected barricades, held a General Assembly, and began plans to fix up the space for community use. Using SWAT teams and a ladder truck, police swarmed the warehouse, making 20 arrests and setting an unsettling precedent for the escalating use of military-style tactics against nonviolent occupiers who are liberating public space. Occupy Seattle is currently holding a jail solidarity action in front of the King County jail and are requesting all their supporters show up!